5 April 2013: Here is a great idea, published in Gizmag this month. 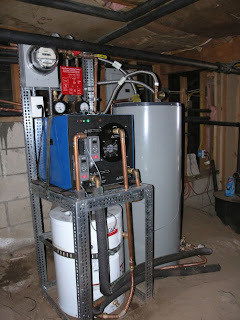 Hal Slater of San Diego has developed a small heat pump to move surplus thermal energy from your cold water tank to your hot water tank. Smart idea for hot countries. Water is the easiest medium from which to take heat or to which to give it (thermal capacity, conductivity, stirrability etc). A heat pump is the ideal way to transfer Thermal energy Energy at one temperature in one medium to a higher temperature in another medium. Note: This would NOT work in England or temperate climate - the incoming cold water is about 12º because it has been in the ground, and you would not want to reduce it to 8º. In hot countries, including California, water pipes in the ground are bringing in the cold water at as high as 26º in summer, and there is plenty of energy available if you can reduce that to 12º and transfer the energy to a hot water tank. In hot countries, winter cold water comes in at about 12º and so there is nothing for the device to do in winter - other methods are needed. In our household, the ratio of Hot water to Cold water consumption is about 1:3, and that would be more like 1:4 if we had shorter hot pipe runs and better pipe insulation. So, there could be a decent sized body of cold water to take energy from if you have a correctly sized tank. 1. If you run the taps and have to remix with cold, what is the benefit? Well with a heat pump, you normally heat a HW tank only up to 51ºC, so you never need to mix it with cold for washing, showering, bathing etc. 3. Could you do it at Peveril solar House? 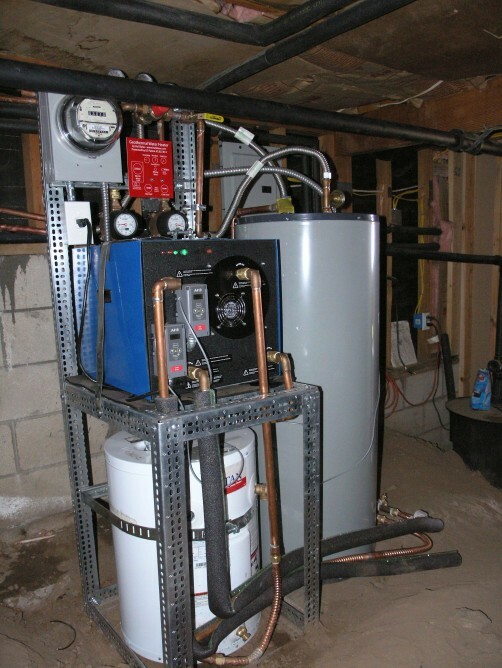 We don't live in a Hot climate!, but if we did, it would require an investment in a large hot water tank (with an inner coil) to contain the incoming Cold water, and circuit design similar to what is going to the existing Sunbox could do the rest. Whenever the CW temperature was higher than 12ºC, it would transfer heat across. 4. What do user of this system do in winter? Well, if you have made the investment in a heat pump, you could use a normal ground loop for the remaining time.